Do you ever find yourself over buying on certain foods? You know when you see an item on sale and buy one or two of the item and throw it in the freezer and then forget you have it, so you buy more. That happened to us, the freezer was getting filled up with chicken breast, so I took the opportunity to make another easy chicken slow cooker recipe. I found this recipe on bettycrocker.com. After reading the reviews on this chicken dish I knew that it would be one that was a must to try. There were several reviews on the site that raved about the chicken be super delicious and easy to make and there was only one review that had anything negative to say about this chicken and that was that the bread crumbs were mushy. Personally I liked the bread crumbs on the chicken and thought that they added flavor to the whole dish over all. 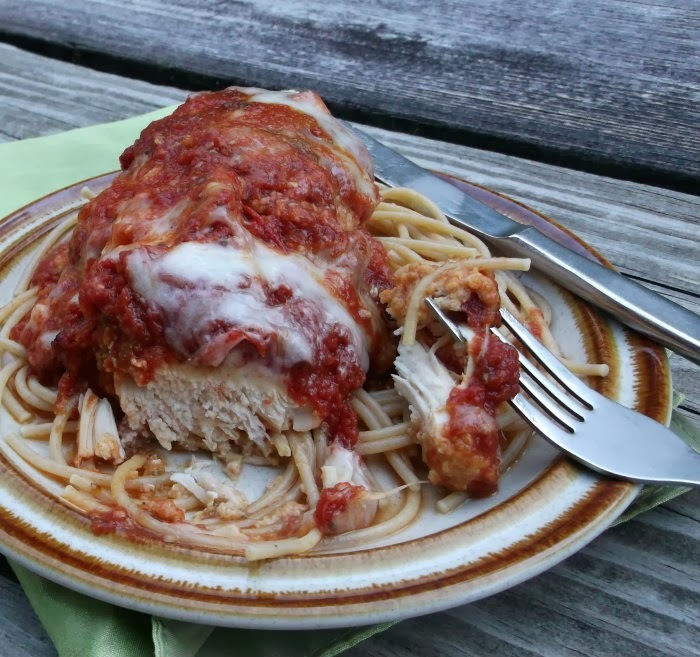 After making Chicken Parmesan in a slow cooker you may never want to make it any other way. It certainly is super easy and full of flavor. The chicken is so tender you can cut it with your fork. We all loved it. 1. Spray slow cooker (I used a 6 quart slow cooker) with cooking spray. 2. In a small shallow bowl, beat egg until foamy. In separate shallow bowl, mix bread crumbs, Parmesan cheese, salt, and pepper. Dip chicken into egg, then coat evenly with bread crumb mixture; place in cooker. Spread spaghetti sauce evenly over chicken. 3. Cover; cook on low heat setting for 5 to 6 hours. 4. Sprinkle Italian cheese blend over top. Cover; cook on low heat setting for 10 minutes longer. Meanwhile, cook and drain pasta as directed on package. Serve chicken with pasta. 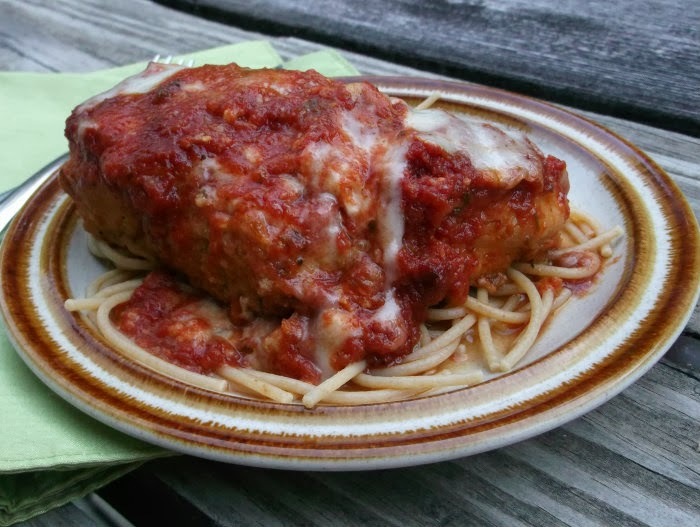 I had no idea that Chicken Parmesan could be made in a Slow Cooker. I never would have thought to try it. So glad you tried it for me! 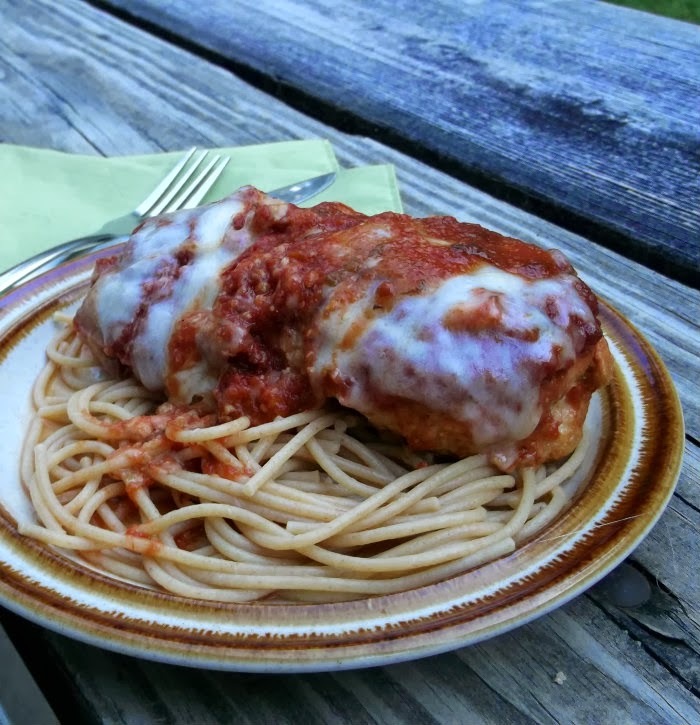 I love chicken parmesan – yours looks wonderful. Love this out-of-the-box recipe for the slow cooker!! Such a classic comfort food! Yeah, I buy too much of certain things, too. I really need to use my slow cooker more – this recipe looks dynamite. Good stuff – thanks.